Hey boppers, I was fortunate enough to catch a midnight screening of an original 35mm print of THE WARRIORS last Saturday Night at the local retro movie house. I’d never seen it with a cinema audience before and their vocal enthusiasm reassured me that cult 70’s cinema will live forever. Obviously, the first thing I wanted to do at 2am as I departed that darkened house of fun was review this face stomping, rumble and strut gem. But, as the testosterone subsided and clarity returned to the head I remembered there was already a critique of the film that I wrote under the nom de plume of John Doe…and with that the FROM THE VAULT section gets its premiere contribution. First published in 2007 on an alternate virtual turf, enjoy the first of what will be many flashbacks FROM THE VAULT. A baseball bat to the face of 70’s cinema, updating Xenophon’s “Anabasis. 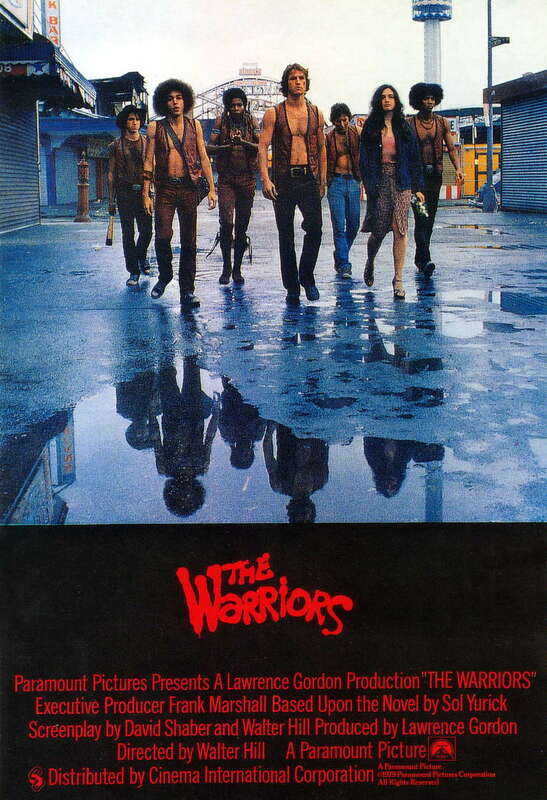 Upon its original cinema release rival gangs rumbled, lives were lost in theaters and consequentially the film garnered a reputation for glorifying bloodshed and the street gang mentality.A comic book style update, The WARRIORS was one of the earliest films to realize the power of mixing ultra violence, cool dialogue and editing for maximum velocity. Brutal and bleak, it’s now a pop culture icon, influential and considered an action classic worldwide. Pumped full of adrenalin and testosterone, the movie opens with all the gangs in New York City meeting in Central Park to form an alliance that will give them ultimate power. Putting it together is the almighty Cyrus (Roger Hill), preaching his gospel to the crowd, riling up the thousands strong posse to believe in his dream. In the height of fervour a rival member named Luther, executes the charismatic leader and frames The Warriors for the crime. Unarmed, with every gang in New York out for blood our tiny band of Spartans must run the gauntlet and make it back to their home turf on the other side of the city in Coney Island. Loyal, tough and refusing to give in, The Warriors must hack their way through names like the Lizzies, The Baseball Furies, The Electric Eliminators, The Queens Bridge mutilators. All of them on the hunt and wielding brass knuckles, chains and baseball bats, prepare for a battle royale. The classic framework of a few brave men facing off against unbeatable numbers is scripted with passion and grandiose vision. Tighter than a virgin wearing a chastity belt the screenplay is in a constant state of movement, each scene pushes into the next and before you know it your along for the ride. Andrew Lazlo’s (FIRST BLOOD, SOUTHERN COMFORT) cinematography is atmospheric and exploits the city surroundings maintaining a mood of imminent, dirty, grimy danger. Swiftly edited with little room for air, supported by a thumping soundtrack that keep the heart rate up, this is B grade action gold that provides A grade fun and adventure. The cast is a mix of low rent actors and real life gang members and though not overly talented thespians, they fill out there roles admirably. This is after all not a film about real life, it’s a hyper reality, one of the first celluloid entries in the street gang genre, and the actors all bring a unique spin to their parts. Worthy of note are Roger Hill as Cyrus, David Patrick Kelly (THE CROW, WILD AT HEART) as loony Luther and James Remar (DRUGSTORE COWBOY) as Ajax. Don’t go looking for a deeper meaning, there isn’t any, this is about brave men who refuse to yield and will do anything to make it home. This bad boy of a film is a John Doe fave, an action thriller that does all the work without insulting your intelligence, delivering on its uncompromising promise and inspiring the recent video game of the same name. Check out the kinetic trailer below and tell me this isn’t everything action cinema is about. Click Below and see to see the mighty Cyrus spread his word at the start of the film…..Can you dig it?